At the December 2015 TCC holiday party in Miami, a fine time was had by all sharing their past and future Travels, and drawing numbers for all wrapped Travel Souvenirs to get and rob each other until end of Gift Exchange! 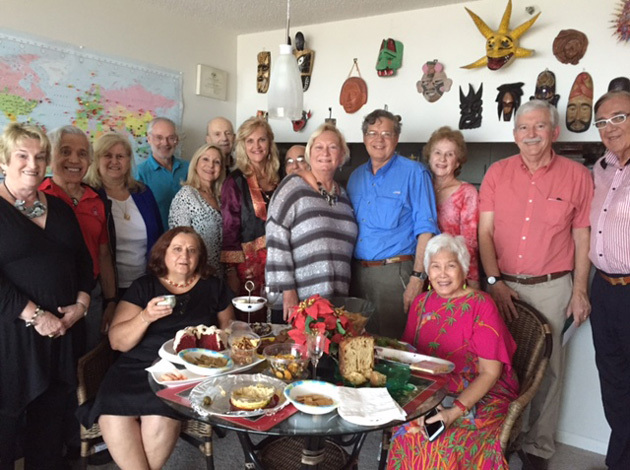 Standing, left to right: Sally Schmillel, Nikos and Barbara Spanakos, Ted Cookson, Marlene Soloman, Steve Warner, Chapter Coordinator Jan Novar, Cal Rosenbaum, Bev Anderson, Richard Reines, Louise Gross, Leon Hochman and John Novar. Seated: Hostess Anush Dawidjan and Luisa Lu.